NOTZDesign offers a full range of custom vinyl graphics, be it store front windows, truck lettering or even decals as a fundraiser for your sports team! From small decals to covering entire walls, we can help you to select the right technology, materials, design and layout. We can also offer full service installations for you. We’re sure you’ve seen some of our work around town – and if you have, you realize how well this kind of advertising works! 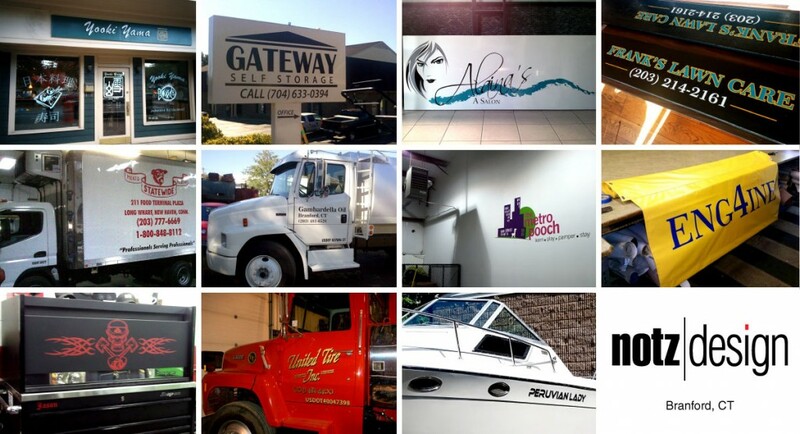 Our vinyl graphic clients include local businesses like United Tire, Alaina’s Salon, Metro Pooch, Yooki Yama, ACE Trailer and many more. Our artists have created many custom graphics that have made countless objects from toolboxes to guitar cases into unique and beautiful pieces of art. They added more individual expression to stock and custom cars and helped express the feelings of many boat owners through unique lettering of their vessels. Please contact us if you’d like more information – vinyl graphics are more affordable than you may think, and no matter if you need us to match an existing fleet or are looking for a unique decal, we’re able to offer you the right solution at the right price! This entry was posted in Our Services and tagged decals, lettering, truck lettering, vinyl decals, vinyl graphics, wall decals, wall graphics. Bookmark the permalink. ← Yooki Yama’s new website is live!